(Windows) Open the command prompt and run the "%plesk_bin%\ai.exe" --consolecommand. Reseller and customer accounts, as well as their subscriptions, are created on the destination server, along with all the domains, addon domains, subdomains, and domain aliases. All the corresponding settings are migrated as well. Hosted content, such as databases, mail, and websites’ content is also migrated. Server-wide Plesk settings are not migrated. Migrating from a Plesk server can be done either via the Plesk interface, or via the command line. (Plesk for Linux) The login and password of a root user on the source server. Alternatively, you can choose to authenticate via SSH keys. Note that from this point onwards, you can leave the Migrator interface without losing your progress – the migration will remain in progress until you finish it explicitly. To continue from where you left off, click Server Management > Extensions > Plesk Migrator and then click the corresponding migration in the list. By Subscription. 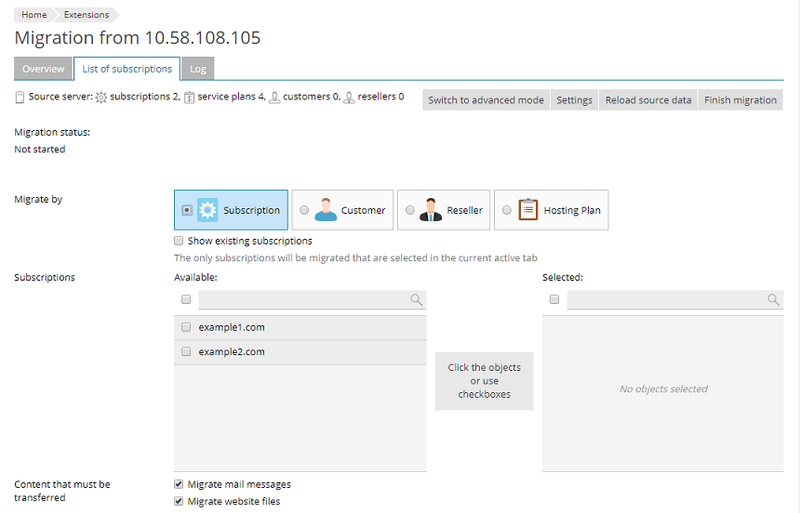 If you migrate a subscription owned by a customer or a reseller, the corresponding customer/reseller account will be migrated as well (unless a custom subscription owner is specified – see below). The hosting plan the subscription is based on will also be migrated. For more information or assistance, contact our 24/7 customer support.